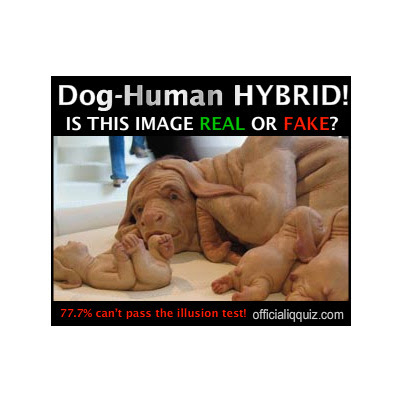 I just noticed the work 'The Young Family' by Patricia Piccinini on one of those "quiz" banner ads. Does this make for a new piece of net-art? The definition of real vs. fake is kinda grey. I mean, the work is real, but is the quiz asking if you think that the probability of a Dog-Human hybrid is real? Or if the image is real or PhotoShopped. Is it actually referencing the idea of an image itself? Is an image real or a representation? 22.3% seem to know the answer. I clicked on the link, which naturally led to one of those lame SMS-based subscription services masquerading as an IQ test (with a link to a MASSIVE terms and conditions page). I didn't click all the way through, but the first question had nothing to do with Piccinini's work. At the time of writing, Piccinini's Wikipedia page has "multiple issues".